Over 100 Shell to Sea campaigners took part in another protest march near the Corrib Gas terminal on Tuesday last. Workers and haulage trucks again entered the site at Bellanaboy. Shell to Sea says it will continue the early morning protests at the terminal site. Meanwhile, Shell says that work on building the €200 million terminal will get underway next year. Also on Tuesday, Shell to Sea condemned threats allegedly made against Noel Dempsey, the 26 County Minister for Communications, Marine and Natural Resources. This followed an interview on RTÉ Radio in which Dempsey said that Gerry Adams and Ian Paisley were more willing to reach agreement than members of the Shell to Sea campaign. Allegedly two phone calls were made to the Minister's office just after the broadcast, with what staff described as "explicit death threats" to the Minister. Gardaí are launching an investigation into the calls. Dr Mark Garavan, a spokesperson for the Shell to Sea campaign, said it totally condemned any such calls and had nothing to do with them. He said that the group would repudiate any threats to the Minister and said that the threats were a disgrace and a distraction. A prominent Shell to Sea campaigner was hospitalised after a confrontation with Gardaí in Co Mayo last week. Maura Harrington was treated for head and neck injuries after falling to the ground when she and other protestors approached Gardaí protecting the gas terminal site in Bellanaboy on Friday, 13 October. The incident happened while local residents were gathering at the site for their daily protest. 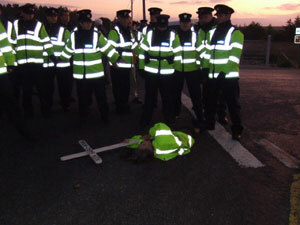 At around 8am, Gardaí forcibly moved against the front line of protesters between the Shell Road to Bangor and the terminal site. As the convoy of vehicles approached the junction between the haulage route for the site and the main road, Maura Harrington was among a small group who came forward to block their path. A line of Gardaí hurried forward to contain them and she was pushed back, falling over and banging her head on the road. Eyewitness accounts say that she received a two-handed shove from a Garda. Harrington later reported that she had been knocked to the ground by a Garda on the site. She was taken to Castlebar hospital with suspected concussion. The ambulance took over half an hour to arrive from Castlebar, as it had to drive through lines of police. During this time she remained immobile on the ground, covered by coats and blankets. She was treated at the scene by another protestor, Independent TD Dr Jerry Cowley, who thought she may have suffered concussion. Commenting on the Garda operation, Harrington said that the Gardaí recently stationed in the area were "out of control." The cost for the Garda presence is estimated to be in the region of €1m. Shell to Sea campaigners who claim they have been physically abused by the Gardaí are planning to take legal action against the force and say that, despite abuse and intimidation, they will continue protesting at Bellanaboy. Sinn Féin TD Martin Ferris condemned media and Garda allegations of intimidation against Shell to Sea campaigners and strongly criticised the manner in which the protestors at the Bellanaboy refinery have been demonised and treated as criminals by the mainstream media and the state. He also voiced his concern at the manner in which the Gardaí are handling the protests, and the increasingly heavy-handed fashion in which they are dealing with the situation. 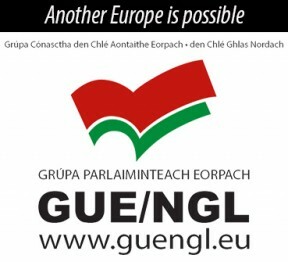 "It is important that these solidarity protests not simply continue but escalate. Any who are able to get to Bellanaboy to help local people should do so. For those who cannot, I would urge them to support pickets of Shell stations, offices and facilities in their local area. After years of campaigning, it is clear that Shell has got the message that their on-shore processing plant is not wanted. They are merely indifferent to the wishes of local people and prepared to lie, cheat and intimidate to get their way.